An early sawmill operated near Mill Street from 1905 to about 1914. 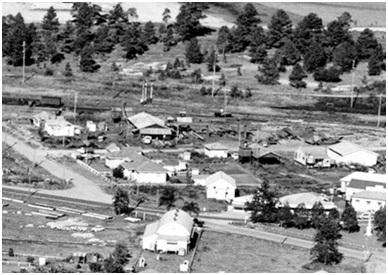 A later and better-known mill, known as Campbell’s Sawmill, operated in this area from 1944 until 1967. 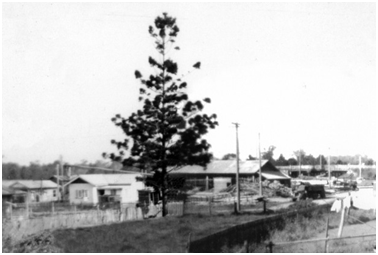 It was established by Colin James Campbell (1917-1972) who, with his father George, arrived in the Petrie area from Toogoolawah intent upon establishing a modern sawmilling enterprise using the very best equipment then available. It was one of the first mills in Australia to use hydraulic equipment for positioning logs on the main saw bench. The addition of a planing mill ensured that timber of any size and grade could be supplied to the construction industry, including chamferboard. The mill employed from 15 to 25 workers and the complex, which occupied both sides of Mill Street, included a firewood depot. Hardwood timber was sourced from the local area and trucked from as far away as Neurum and Bellthorpe. As the premises backed onto the North Coast Railway, logs could also be railed direct to the mill. Aerial view looking east over the area between Anzac Avenue, Whites Road and the North Coast Railway, 1957. Buildings associated with Campbell’s Sawmill occupy both sides of Mill Street which runs from Whites Road through the centre of the photograph.